Do remember your first soldering iron? We do. It plugged into the wall, and had no way to adjust the temperature. Most people call these kind of irons “fire starters.” Not only are they potentially unsafe (mainly because of the inadequate stand they come with) they can be hard to use, slow to heat up, and you never know what temperature you are soldering at. [Mike Doughty] wondered if you could hack a cheap iron to be temperature controlled. He began by taking apart an iron, and adding a K-type thermocouple to the mica heating element with the help of a fiberglass sleeve. After a few tries at fitting and finding the right placement for the thermocouple, he then reassembled the iron, and attached everything to an off-the-shelf industrial PID controller. Not one to trust that everything was working, [Mike] began to test the iron. He used a Hakko FG-100 soldering iron tip thermometer to measure the “real” temperature of tip, and compared it to the value the K-type thermocouple was reporting it to be. The results were fairly impressive (as seen in the video after the break). Only about 10 degrees out. Not too shabby. He concluded that although it did work, it wasn’t a replacement for a high quality soldering station. We suspect the real problem with this idea is that the mica heating element is way to slow to respond to any thermal load that the tip is given (but then neither did the unmodified iron.) If you’re interested in hacking together your own soldering station, you might be interested in the open source soldering iron driver. [S Heath] is a Coleman lantern collector. Coleman lanterns can run from a variety of fuels, however they seem to run best with white gas, or Coleman fuel. Store bought Coleman fuel can cost upwards of $10USD/gallon. To keep the prices down, [S Heath] has created a still in his back yard to purify pump gas. We just want to take a second to say that this is not only one of those hacks that we wouldn’t want you to try at home, it’s also one that we wouldn’t try at home ourselves. Heating gasoline up past 120 degrees Celsius in a (mostly) closed container sounds like a recipe for disaster. [S Heath] has pulled it off though. The still is a relatively standard setup. An electric hot plate is used to heat a metal tank. A column filled with broken glass (increased surface area for reflux) rises out of the tank. The vaporized liquid that does make it to the top of the column travels through a condenser – a pipe cooled with a water jacket. The purified gas then drips out for collection. The heart the system is a PID controller. A K-type thermocouple enters the still at the top of the reflux column. This thermocouple gives feedback to a PID controller at the Still’s control panel. The controller keeps the system at a set temperature, ensuring consistent operation. From 4000 mL of ethanol free pump gas, [S Heath] was able to generate 3100 mL of purified gas, and 500 mL of useless “dregs”. The missing 400 mL is mostly butane dissolved in the pump gas, which is expelled as fumes during the distillation process. 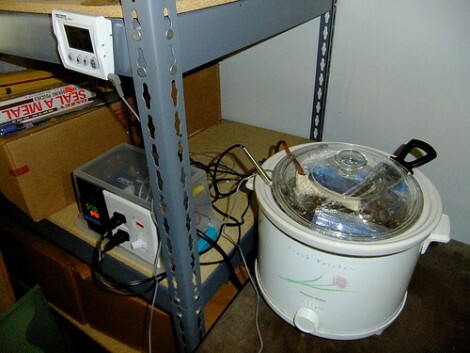 Tempted by what sous vide cooking has to offer, but balking at the price for a unitasker, [Lee’s] father in law set out to see if he could rig up his own precision temperature controlled cooking system on the cheap. He immediately hit eBay and shelled out about around $75 to get his hands on a solid state relay, PID controller, and temperature probe. As you can see above, a crock pot serves as the cooking vessel. We’ve seen this method before, either splicing into the power cord, or providing a single outlet on the controller. This version provides a PID controlled outlet to which the appliance can be plugged in. The other outlet in the socket is always on and powers an aquarium pump that circulates the heated water during the cooking process. The result works quite well, even though it wasn’t a huge cost savings. There are a few issues with positioning of the temperature probe, but that may be where experience comes into play. [Nathan] had an small router kicking around and thought that he might as well put it to good use. He had always been interested in getting a better handle on his espresso machine, and figured that the router would be a perfect Linux-based PID controller. 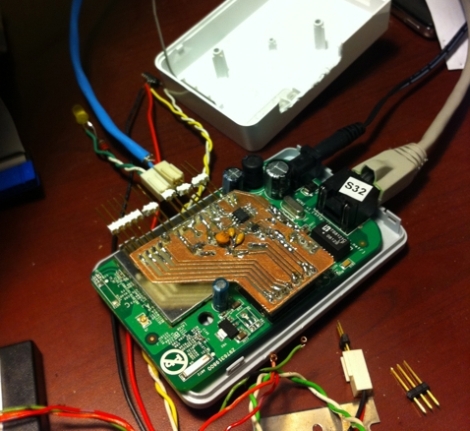 He installed OpenWRT on the router, then disassembled it in order to get access to the router’s GPIO pins. He built a small PCB that allows him to get temperature info from the machine to the router using i2c. [Nathan] put together a PID package for OpenWRT, allowing him to control the machine over SSH, though he may build in a user-friendly web interface sometime in the future. He says that most espresso machine PID controllers he has seen come in the form of big ugly boxes slapped on the side of the machine’s case, though we have to disagree with him on that point. Opinions aside, he is going for a minimalist design, and while he says that he is only about half way through the project, we think things are looking promising so far. When everything is said and done, we hope to get a much closer look at all of his code, schematics, and more information on the router he used as well.